June 20, 2012 By Joe | Heads up: Buying via our links may result in us getting a commission. Here's why. Is this going to end up being Epaulets v 2.0? Button tab, throat latch, storm tab… it’s that extra piece that hangs from the side of a sport coat’s lapel that you most often see on tweedish hunting style jackets. It’s a detail that harkens back to a time when the sport coat would often do duty as a functional piece of outerwear. Y’know, say a freak thunderstorm rolls up while you’re galloping through the forrest on your fox hunt. You’d flip the lapels up (thou shall popeth thy collar good sir) and you could keep the wind and rain out by buttoning the gap closed with the tab. Sort of like how you can close a trench. The J. Crew shown above takes the traditional details of a cold weather sporting jacket and slaps them on a lighter color / lighter weight fabric. The patch pockets, 3-button front, and the button tab collar are all things you’d expect on a nubby, rough, winter ready wool. Instead, it’s an oxford cotton that just came out for summer. $348 is way up there. But for argument’s sake, pretend it was in the $100s like their corded cotton sport coat. And Banana Republic also just came out with one that’ll get nicely priced with a sale ($128.60 when 30% off). Is this something you’d prefer to have? Or unless it’s on some tweed hunting thing, does it end up being a distraction? It’s 99% aesthetic, yes, but it’s functionality is to help keep bad weather out. And these are summery sport coats. Has a bit of a this-doesn’t-make-sense jorts-esque feel. Also appearing on Banana Republic’s new cotton blazer. These going to be on everything now? Filed Under: Clothing Tagged With: Banana Republic, J. Crew, lapel tab, storm tab, summer blazer, throat latch, trend, what's that tab on a blazer called?, would you wear it? I like BR’s version more than JCrew if only because I find it weird that JCrew’s has two button holes + it looks like it’s peeking from under the lapel. BR’s looks more natural and functional imo. I would, but not for that absurd price. No to either because they dont exactly look casual enough for it. The patch pocket on the J Crew one balances it out a bit, but the material is too formal for the look. I did score a herringbone blazer from Lands End Canvas last winter. It has leather covered buttons and really works with the tab collar. Cant find a pic but its probably the only one I would sport with the tab collar. banana republic yes, jcrew… lord, no. That collar just threw up in its own mouth. The storm tab is a buttonhole, the lower one is a boutonniere. The boutonniere, while french for “buttonhole”, is not used for buttons, but for flowers as decoration. There has never been a button to go with the boutonniere, whereas the storm tab originally was. I think the button tab can look really sharp. The BR does it well. That J. Crew, on the other hand – it’s like when you’re watching a nature show and the majestic gazelle effortlessly gliding across the plains is suddenly sporting an unsightly erection. Thanks J crew. You’ve ruined breakfast. Cool idea (reminds me of Watson in the first Robert Downey Jr. Sherlock Holmes movie), but not the greatest execution. It seems a bit too prominent. I just bought the J. Crew sport coat. Should be arriving today. I like the look of it on the model, we’ll see how I feel about it once I try it on. I much prefer the BR version. 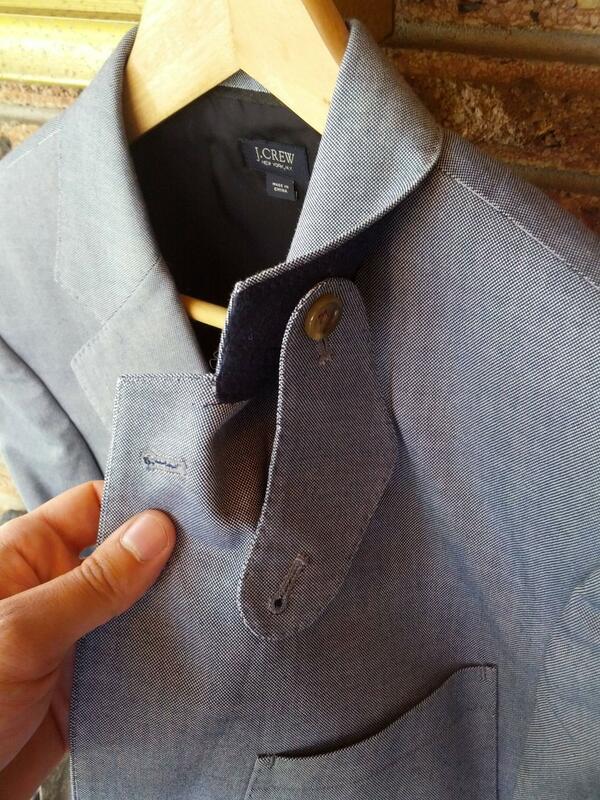 LEC had a herringbone sport coat with the button tab last fall that looked really sharp too. I think the key with each of those is that they did not also include the bouteneire, which looks weird on the J. Crew coat. If it exists, there should be two buttons on the inside of the collar so that it can be hidden when not in use. In other words: this is awful. I don’t like the BR one at all because it just looks like an oddly placed boutonniere hole. Like they messed up and put it on the wrong side of the lapel notch. I’d have to see the J Crew in peson but I’m gonna have to say I don’t think it goes with this lighter color scheme. The button tab reminds me of hunting jackets for country use. I think the jacket should have an earth tone color to be appropriate – khaki, brown, burgundy or a green come to mind immediately. A checked pattern would also be really cool. 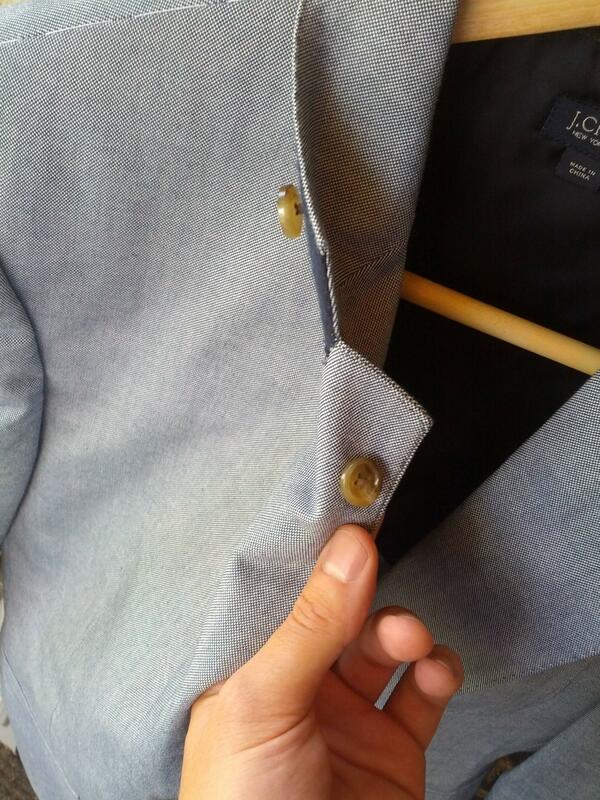 It makes no sense to have the button on a lighter jacket. It’s meant for when you need to button up. You will, literally, never do this in the summer heat. I see this and I think it’s like the “dapper” version of putting spikes on shoes. It serves no purpose and looks plain wrong. http://i.imgur.com/Qoqjr.jpg . The fabric feels very nice and I haven’t spotted any defects in the construction yet. I haven’t yet decided whether or not I’m going to return it, but my impressions are very positive so far. I guess I missed this one on the trend radar. On a tweed jacket, maybe. On a summer blazer, no thanks. Plus, $350 for a J crew sport coat? Where’s the Muytjens meter when you need it??!? It was my understanding that, historically speaking, these button holes were for attaching a leash (my words) that was sewn into the liner of old Fedoras and buttoned to the lapel, to keep them from blowing away on windy days. Perhaps this is far fetched. I do not remember where I had heard that. I bought that herringbone sportcoat from LEC. It was like FIVE INCHES too short. You must be a really short dude for that coat to have worked out for you. I effing hated it.